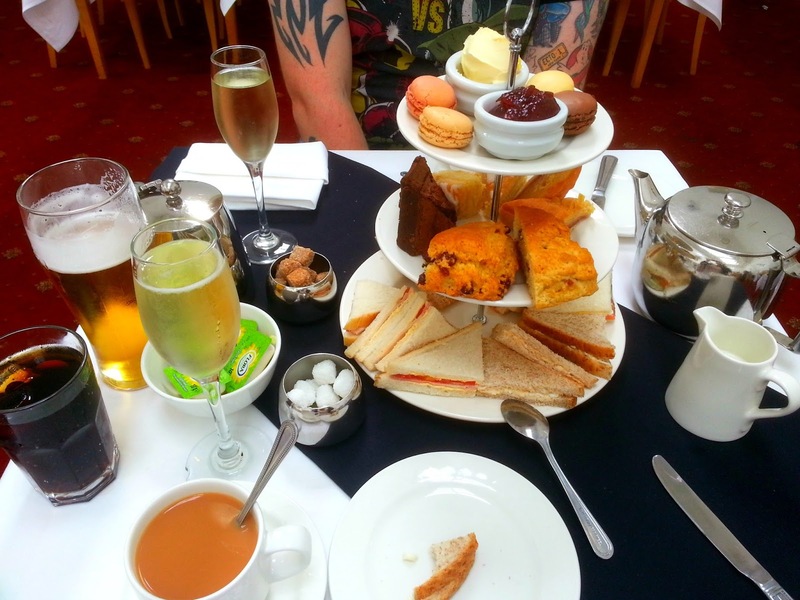 Earlier on in the year I won a fantastic competition that included numerous things, one of them being Afternoon Tea. I finally managed to make use of my prize when I visited Manchester a few weeks ago. The venue of the afternoon tea isn't somewhere I'd probably choose if I was hunting for somewhere to spend my money, mainly due to it being approx 3 miles from the city centre. The setting wasn't as grand like previous afternoon tea's I've experienced, but nonetheless, the actual service was 100%. A lovely Cypriot lady was serving us throughout and was very attentive, polite, and couldn't do more for us if she tried. Once seated, we were asked what we would like to drink. I fancied something cold to quench my thirst so went for a diet coke and Mike went for a beer. Then the teas and coffee's came out in stainless steel teapots (which was a little disappointing.. I much prefer a good old fashioned floral teapots/cups being the granny I am!). 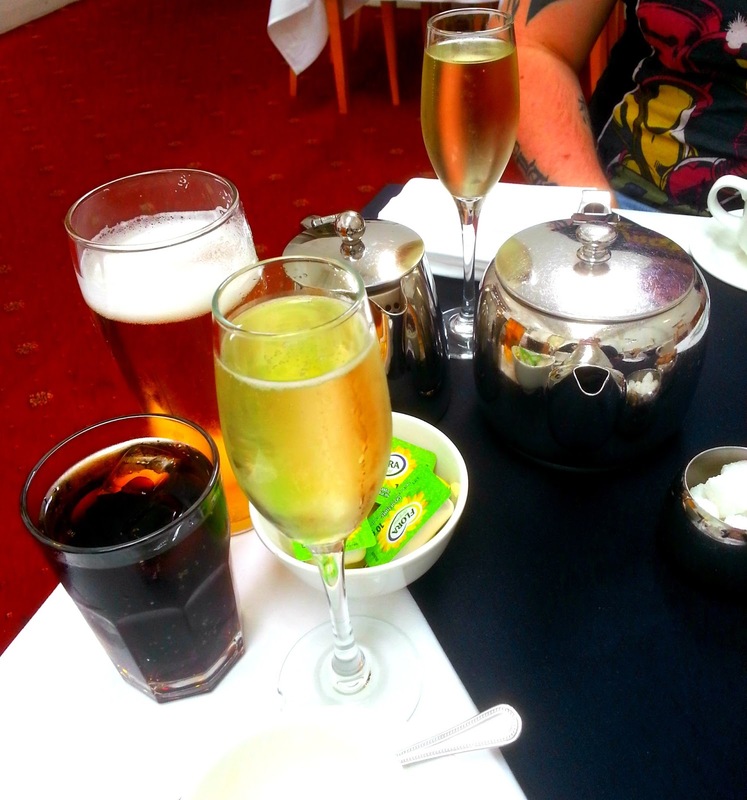 I then completely forgot that the prize included champagne... so we had 3 drinks each on the go.. spoilt for choice! haha. Shortly after our food came out which included the traditional sandwich fillings (salmon, cucumber and cream cheese etc), and although I've tasted better at afternoon tea, they were still nice. There was a large selection of cakes on the 2nd tier, which consisted of scones, bakewell tarts, lemon drizzle cake and chocolate brownies. They were all of a really good size which I was pretty impressed with, all of them tasting homebaked as well, which is a huge factor for me. The top tier consisted of a selection of macaroons (which personally I'm not fond of but this is obviously personal choice, because I know macaroons are usually well-loved... I'm quite clearly just odd!). 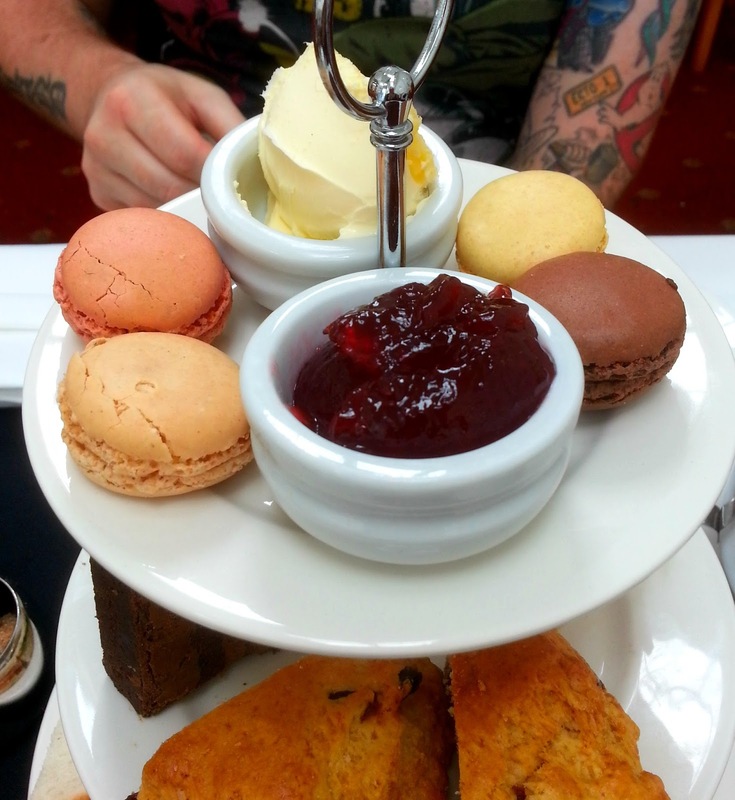 The pot of clotted cream and jam also sat with the macaroons which accompanied the scones nicely. It's safe to say we were both well and truly stuffed afterwards... oh.. and those extra drinks that we ordered (the coke and beer) - we ended up getting free when really we should have paid! How kind of them! 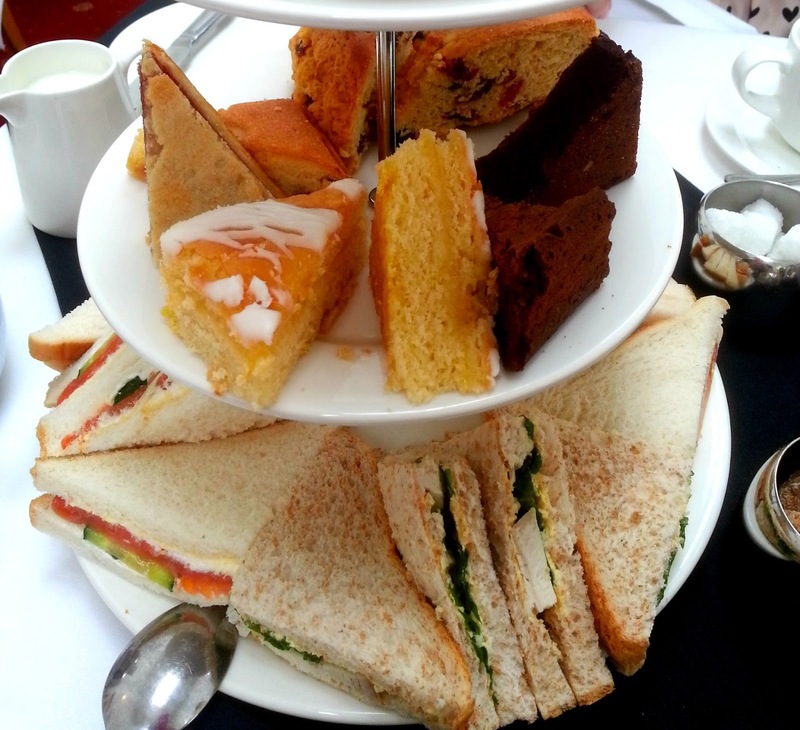 Overall, when having afternoon tea the setting is an important factor for me because I feel it adds to the overall experience, however this time, the setting wasn't fantastic, it was a little tired looking and old fashioned and just seemed to be lacking an atmosphere. The service however was perfect, I really couldn't have asked for more. We got served by the same Cypriot lady throughout our stay and she appeared to work long hours, and never once did this show through her mood when dealing with us. The food was good - As previously stated, I've had better at other venues, however I was impressed with the portion sizes and the standard of food, although wasn't excellent, was not poor either. 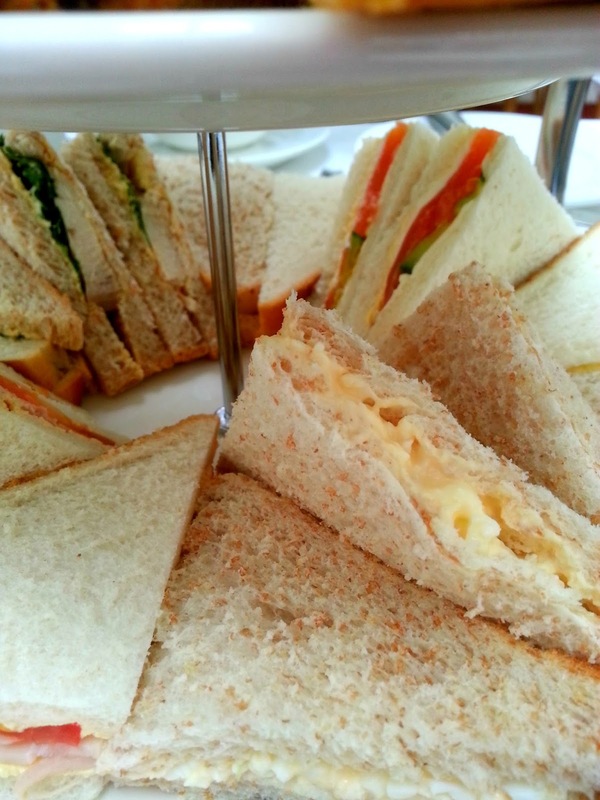 Where's your favourite place to go for Afternoon tea? I'm going to Liverpool in a couple of months and want some recommendations! 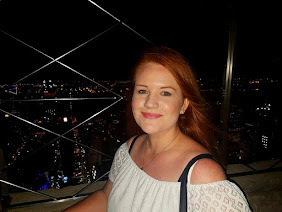 Don't forget to enter my competition! I'm giving away a load of beauty items including some benefit mascara and nail art goodies!